When Isabel Gutierrez first started taking courses at El Paso Community College while still in high school she was a first-generation college student. That inspired her father to take a few college courses himself. Now, as she prepares to graduate this month with both her high school diploma and an associate degree, Isabel jokes that her first-generation college student status might be in jeopardy. “I was like, ‘You couldn’t have waited one more semester?” Isabel laughs. While they joke, it’s clear Matthew and Isabel are extremely proud of their parents for returning to school, and believe their advanced pursuits influenced that decision. Paul Covey, principal of Valle Verde Early College High School in Ysleta ISD, is accustomed to these types of family stories, having led this immersive campus for the past 10 years. The model, which allows high school students to take college courses directly on a college campus, is empowering students and their entire families. It’s a crisp morning in El Paso, Texas. It’s quiet around the 32 modest-looking portable buildings that make up the Valle Verde campus. The sound of a bell breaks the desert air, portable doors fly open, and students pour out chatting about coursework. Freshmen and sophomores settle into their next period at the high school campus, while juniors and seniors stroll across the parking lot to El Paso Community College to attend classes alongside college students. While today there are nearly 200 Early College High Schools in Texas, Valle Verde was an early pioneer of this immersive model. It’s not just about the credit hours, Covey says. Valle Verde provides students with rigorous instruction to increase college readiness, offers social support services and counseling to help students succeed, and reduces barriers to college access through early exposure to a university environment. Paul Covey, Principal at Valle Verde Early College High School, chats with a student. 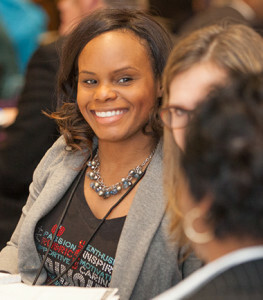 Covey serves as an Alumni Regional Director for Raise Your Hand Texas and is part of the Raising School Leaders Program. (Left) Sisters Hannah and Noelle Hayes, a freshman and senior respectively, say their experience at Valle Verde provided them with a running start toward the future. (Right) El Paso is located in the western corner of Texas, at the base of the Franklin Mountains. Covey and his team focus on recruiting students who are first generation college students. These recruitment efforts begin in area middle schools with campus tours, summer camps, and parent information nights. Students have to submit applications, participate in an interview, and commit to graduating in four years with a Distinguished Achievement Plan High School Diploma and an associate degree from El Paso Community College. Covey says he wants prospective students to see the early college campus and understand the importance of the experience and culture beyond the facility. He is intentional in engaging and supporting families from that initial connection all the way through their high school experience and beyond graduation. The investment is paying off. Recently, the campus was recognized as an Apple Distinguished School by Apple, one of America’s Best High Schools by US News and World Report and one of America’s Best High Schools serving low-income students by Newsweek Magazine. In 2017, Valle Verde ECHS was recognized as a National Blue Ribbon School. In 2016, US News and World Report and Newsweek ranked Valle Verde ECHS as the top Public High School in El Paso. The families that choose Valle Verde, Covey says, do so because they want their kids to have a stronger springboard for the future. And, as evidenced by Isabel and Matthew’s stories, the kids’ experiences also serve as a springboard for strengthening the future of their families. It’s commencement day at El Paso Community College. Generations of families are gathered to celebrate the achievement of their graduate. Valle Verde seniors who have earned their associate’s degree will walk alongside their college peers. Another graduation ceremony will be held several weeks later at the high school campus, at which time students will receive their high school diploma. Graduation is a testament to and celebration of the school’s impact. “To see their kid walk across the stage to get their associate’s degree – it’s life changing, not just for their child, but it’s going to have an effect on the whole family,” Covey says. Covey chokes up thinking about the expression he sees on the faces and in the eyes of the moms, dads, aunts, brothers. This spring, 57 out of 89 seniors will graduate with an Associate of Arts degree from El Paso Community College. Those who did not achieve a full 60 hours of college credit still graduate with an tremendous head start. Many students also receive financial aid services and support. Campus officials estimate the graduates from the Class of 2018 will receive $6.5 million dollars in post-secondary scholarships and financial aid. Graduates of Valle Verde attend prominent colleges and universities in Texas and the United States, including the University of Texas, Rice University, the Massachusetts Institute of Technology (MIT), and Columbia University. For Isabel, the experience at Valle Verde helped her realize she loves studying. She plans to get her biology degree at the University of Texas El Paso and attend medical school. Matthew will attend St. Mary’s in the fall and plans to major in biology and minor in education. His dream is to teach high school, then college-level biology. He, too, would like to attend medical school.